If you are like the average person you spend 2-4 hours per day bent over your cell phone. That means you are spending at least 700-1400 hours per year with your head tilted down and your shoulders rounded forward. This dramatically increases the workload on your neck muscles and can create incremental stress on your neck and upper back tendons, ligaments and discs. An adult head weighs 10-12 pounds in the neutral position. When your head tilts forward 15 degrees, the forces seen by your neck increase to 27 lb, at 30 degrees it's 40 pounds, at 45 degrees it's 49 pounds, and at 60 degrees it's 60 pounds. No wonder neck and upper back tension and pain are so prevalent! 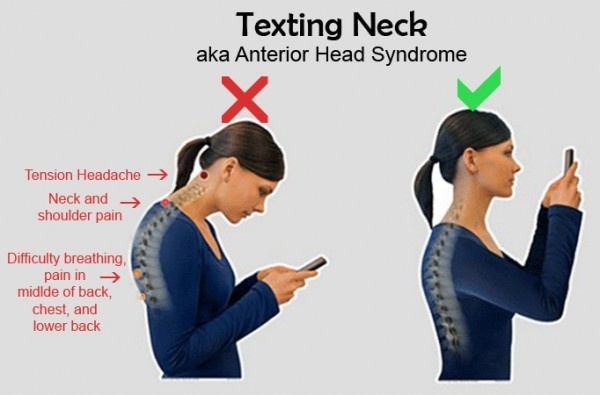 Hold your phone up in front of you, keeping your neck in a more neutral position. Sit tall, with your seat at the back of your chair. If you are sitting slouched you it's very hard not to slouch over your phone. Limit your time spent on your phone. If you need to be on your phone a lot, break it up into smaller sessions of time. Exercise. Get your body moving in different movement patterns avoid muscle imbalances and decrease muscle tension. If you are having pain or muscle tension from spending too much time looking down, a physiotherapist help. We can do hands on treatment to relax your muscles and restore normal joint mobility. Specific exercises can restore proper muscle balance and ease pain. We can teach you other ways to reduce neck strain. It's not too late and you are not a lost cause even if you are tied to your phone!